Enjou has been making gourmet chocolates for 25 years! They have over 5,000 molds to accommodate any party or event theme. Their chocolates make a lasting and "sweet impression". Wrapped in a gold and silver ribbon offered in 1/2lb and 1lb Assortments. 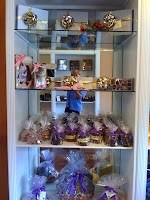 Assorted chocolate covered nuts, caramels, jellies, fruits, cremes and truffles. An example of what these would contain is Chocolate Covered Oreo's, Chocolate Covered Pretzels, Nonpareils, 4 Piece Assortment Box and Solid Foiled Stars. Prices range from $29.95 to $59.95. Dark, Milk, White and Nonpareils Chocolate Covered Pretzels (Large and Mini). Available from Ballet Slippers to Footballs. We have just a small selection of what Enjou offers.